This project started as a casual conversation with a friend about how wonderful Justin's Honey Almond Butter is. Somehow, the discussion led to my friend spreading almond butter on top of existing peanut butter cups and making a snack of that combination. With her birthday around the corner, I realized that there was a more elegant way to combine these two delicacies, and the honey almond butter cup project was born. I'm always fascinated by opportunities to combine different manufacturing processes into a coherent project. It's a big bonus if the project affords creating multiples - hence my love of molds, fixture plates, and CNC manufacturing. 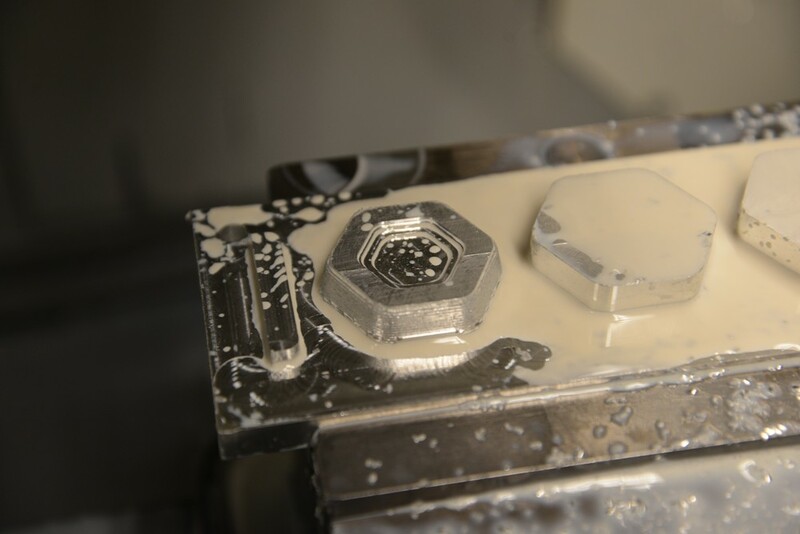 The only logical way to move forwards with this project was therefore to CNC mill aluminum tooling which I could use to make two-part silicone molds for chocolate fabrication. Since I didn't have any knowledge about the flow characteristics of molten chocolate, I designed my mold geometry the way I would approach a sand casting project. After machining the aluminum "pattern", I turned acetal plugs to create pouring cup, sprue, and riser geometry in the final silicone molds. Since the plugs snap into place in the aluminum positive, the silicone mold is removable after it is cast. The final packaging was laser scored and cut. Soon after I finished this project, I found out that Justin, brilliant man that he is, already rolled out some peanut butter cups of his own. No almond butter ones yet, though. Maybe we can collaborate on the next run. 6061 aluminum billet prepped and loaded into a Haas MiniMill. Coarse material removal before beginning surfacing. First surfaced top cup geometry. One side of the completed aluminum tooling for the silicone molds. This side was used to create the geometry for the top surface of the chocolates. 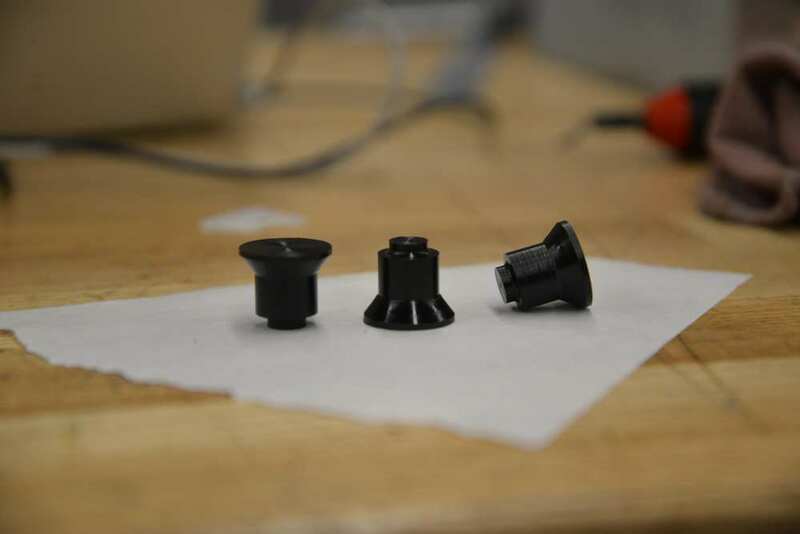 Turned delrin plugs to create sprue and vent geometry in molds. Aluminum tooling, clamped into the mold frame and ready for silicone. Other side of tooling with Delrin plugs snapped into place, pre-silicone. Top of laser cut-and-scored packaging. Injected and cooled chocolate, pre-filling. Done and packaged. The whole package was housed in a custom envelope before delivery. The groove running along the top edge can be filled with tinted white chocolate to indicated the contents of a specific confection in a multi-flavor batch.